At the beginning of 2017, I was in the market for a more modern car to replace my 2004 Saab 9-3 Aero. I do a lot of kilometres each year, so I was looking for a car with relatively low kms on the do that would have excellent fuel economy, would be sporty and be a head-turner. 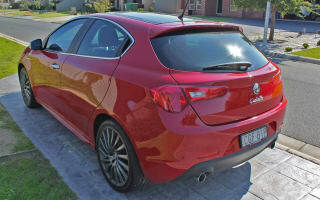 With a budget of under $20,000, the Alfa Romeo Giulietta fit the bill. I love a bargain and that’s what the Giulietta is in the used car market. I got a very well specced 2012 Giulietta JTD-M with essentially the Sportiva Pack (Released for MY2013). That meant I got a full leather interior, 18-inch alloys, sport suspension, Brembo brakes, dual exhaust, dual sunroof, and QV bodykit. In fact, unless you had a keen eye, mine looks like a QV series 0. All of that on top of the generous list of equipment, like dual-zone climate control, Bluetooth, and LED tail-lights and running lights. It cost $17,500 with 55,000km on the clock. Bargain. After six months of ownership and 20,000km this is my evaluation. I have a love, and sometimes hate, relationship with the car. I love the fuel economy; on average I use 5.7L/100km. However, this can go upon to 6.5L or drop as low as 4.5L/100km. My commute is between Albury and Wodonga, so I usually have a mix of slow moving traffic and freeway and on average I get around 1000km out of a tank. What I don’t like is the start/stop system to save fuel. I give it a bit of leniency as it is an earlier design but overall it is unintuitive. In fact, for the first few months it was very obtrusive; unfortunately that was as a result of the previous owner having installed a regular battery in place of a start/stop-ready battery. When that began to fail, not only did the start/stop system fail to work, but I’d get transmission shifting issues. Without enough charge in the battery, the TCT transmission can have issues shifting gears. With a new $350 (closer to $500 at the dealer) battery both work as they should. But that does mean shutdowns in turning lanes and at times where I could have otherwise taken the gap in traffic. It just isn’t quick enough to start back up again. The other issue is that if you’re pulled up and a passenger opens the door, you’ll get a message to say ‘start/stop unavailable’ and unfortunately that’s after the engine has turned off. So then you have to turn the car off and back on again. However, don’t let that put you off the car even if I have written a large paragraph devotes to the terrible start/stop system. That’s because the good stuff outweighs the bad, from the compliments to the drive, the car is overall good. The interior is fantastic in parts and could be better in other parts. From the driver’s seat everything is logically laid out, the radio controls are simple, as are the stalks and window/mirror controls. The nicest touch only on the Series 0 are the 4C toggle switches located beneath the radio, which are for front and rear fog lights, start/stop and central locking. Below that are the A/C controls which look good and feel great to use, probably why you can find them in the Jeep Renegade and Fiat 500x. The slab of brushed aluminium is also a very nice touch and passengers tend to want to touch it as its got that cold aluminium feel and texture. However, things that could be improved boil down to two things, material quality and ergonomics. Like most cars in the class, up high the materials are pretty soft and squishy. However, around the cupholders and gearshift the plastic is hard and prone to scuffs. The door cards are well built but I wish the window controls had a little bit of chrome and there wasn’t just a mass of flat plastic around it. Further down and the door bins, while useful, need to be larger because you won’t fit a bottle in them. Back to storage, and you’ll find that the centre armrest while good as an armrest, isn’t great at storing things as coins tend to jam the mechanism. While if you have drinks in the tiny cupholders, then the armrest can’t be used. Really, Alfa Romeo should have redesigned the lower console for the Series 1 or 2 update, I mean they redesigned the dash? In the back, the seats are comfortable and legroom is pretty average, I’d say similar to a LW/LZ Ford Focus. Headroom with the optional panoramic sunroof could be better as people over 5’8″ will need to slouch. As a nice addition the rear armrest conceals nifty cupholders and there is a ski port, but it would be nice if there were map lights in the rear. The seats fold 60/40 and with the headrests all the way down the seats will fold flat. With the seats up the space is pretty reasonable and the single bag hook has come in handy. Technology-wise, the car is pretty average for cars introduced around 2010. The Blue and Me voice system works very well and your phone carrier and caller ID are shown in the centre display. While my car has a Tom Tom socket I believe the previous owner kept it, but Blue and Me becomes more useful with that in place. There is a USB port in the glovebox which works well but with the depth of the glovebox, it can become cumbersome to take your phone in and out. This is where wireless music streaming could definitely come in handy. Other issues I have with the Blue and Me system is the way its menus are accessed through the steering wheel. Essentially, it isn’t conducive to driving and at times the steering wheel buttons can be confusing. If you weren’t told you’d probably not know how to hang up a call for example. If you’re concerned about these things, then I suggest you purchase a Series 1 with the far better Uconnect system and revised steering wheel controls. But as far as functionality, it works well and the base six-speaker sound system sounds pretty good with some EQ adjustment. In terms of driving and handling, it drives well. The DNA switch really does make a difference. In Dynamic mode the cluster does a sweep and the car revs a little. The throttle is now far more responsive and the gears hold for longer. This is great for a twisty road or the freeway. However, don’t use it around town with the TCT. The TCT is a smart transmission, but at times it can be dumb and Dynamic mode exaggerates this. Sometimes it won’t shift up or down and it can cause for some frustrating times. If you’re used to an automatic, it can roll backwards like a manual if the hill-hold doesn’t engage which takes some getting used to. In Normal mode the transmission is tamed and it makes life around town liveable. But still at low speeds it can be jerky, particularly in parking lots at around 10-20km/h. After driving the car for six months I now know how to wrangle a car that seemingly has bursts of life. Somedays it is just a pleasure and the power delivery is silky smooth and the handling tight, but other days it can be so frustrating. I guess thats the Italian engineering. 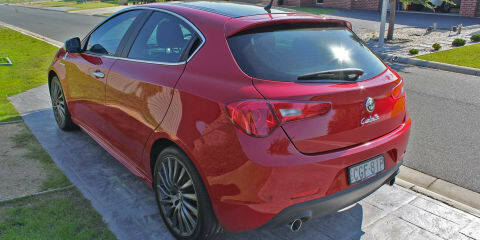 The Giulietta is a car I’d recommend to someone who thinks a Golf is boring. Really, this car goes up against the Renault Megane, not the Audi A3. While it is a car that’s great at some things, it could be improved in other ways. In my opinion it still looks fantastic and it can still turn heads but if I had my time again, I might find the extra money for a Series 1.